Many Windows 10 users have reported the weird problem after updating to the latest version of OS. It is not new as there are many instances where people faced problems after updating to the latest version. Well, the Service Registration is Missing, or Corrupt Windows 10 is the recent issue that has popped up. Almost everyone who has updated their computers to the latest version of Windows 10 is facing the problem. We recently updated the computer and faced the same problem of Service Registration is Missing or Corrupt windows 10. The issue is related to the Windows License Activator, which has some issues after the latest update. In this post, we are going to share some working solutions to fix the Service Registration is Missing or Corrupt Windows 10 error within a few minutes. 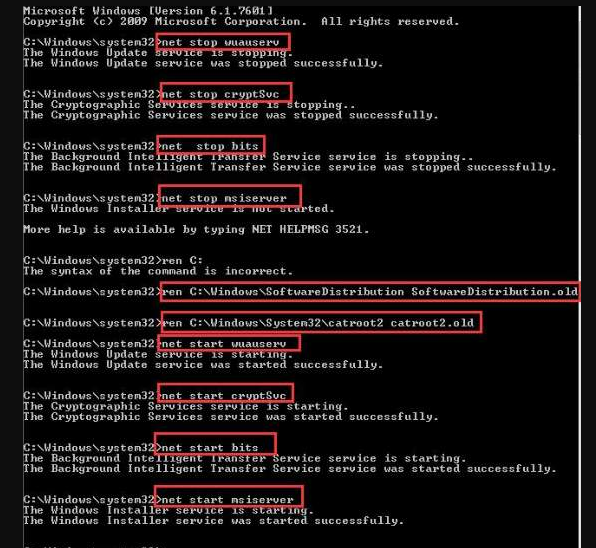 How to Fix Service Registration is Missing or Corrupt Windows 10 Error? The Service Registration is Missing Error appears when the users are performing the system update or have completed updating the system. The issue arises due to the conflicts with the Windows License Manager, which is the service that checks if the operating system is activated with the valid license key. The service keeps checking the system for valid activation key every time the user boots in the OS. But, as the updates may cause some conflicts with the service or by mistake someone has erased the service from the system, then you can face this problem. This is not a serious problem at all if you own a valid license key. But it might be the problem if you have the hardware-activated version of the Windows and don’t have license key as it’s hardware-based activation. Facing the pop up of the Windows Updates Service Registration is Missing, or Corrupt error is annoying. But you can fix this problem within a few seconds by following the solutions that we are going to share. In this post, you’ll find some working solutions to get rid of the problem and fix it without spending too much time. The System File Checker is the system tool in the Windows Operating system that helps you fix almost any problem. The System File Checker tool scans the system, finds and replaces the corrupt or missing files automatically. If you are facing licensing issues like Service registration Windows 10 error, then running an SFC Scan will most likely help you. First of all, open Command Prompt in Administrator mode by press “Windows + X” key combination and then select “Command Prompt ( Admin )” and provide UAC permissions. 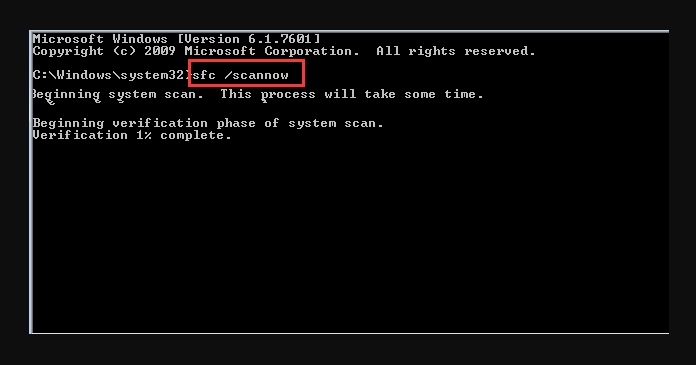 Once in the Command Prompt, type “SFC /SCANNOW” command and press ENTER to start the scanning process. The entire scanning will take a few minutes to complete. Do not interrupt the scanning and in the meantime, you can make a cup of coffee. Once completed, Restart the computer and check if the problem is gone or not. The background services in Windows manages automatic updates and other functions. If you are facing the issues with Service registration is missing, then you should try running some Windows Updates commands, which will activate the services and hopefully fix the issue in your case. Here are the exact commands and the steps to enter them in the command prompt. In the Command Prompt, type following commands one-by-one and press ENTER after each command. Wait for a few seconds after each command to let it complete and then enter another command. Once done, Restart the computer and check if you can spot the error message again or not. If not, then it means you’ve fixed the problem successfully. The Windows Firewall protects your computer from the threats that are trying to enter your computer or send the data to a suspicious server. By default, the Windows Firewall feature is always Turned ON. But if due to some conflicts with the services, the Firewall service may block the communication between the Windows License Manager and the Microsoft servers, which causes the Service Registration is missing or Corrupt Windows 10 error. 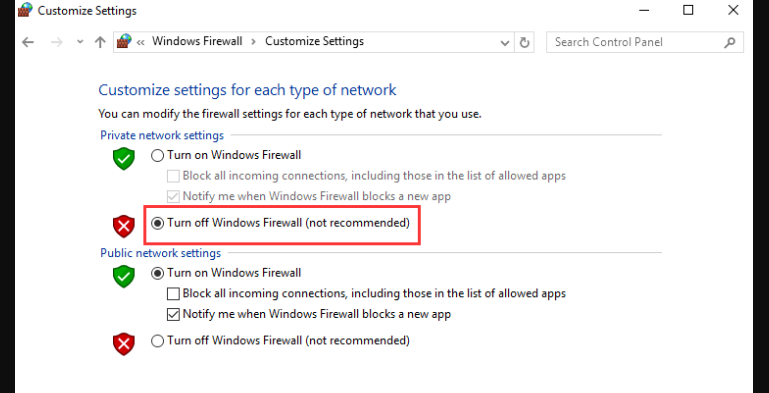 To get rid of this issue, you should turn OFF Windows Firewall and check if the problem is gone or not. First of all, click on the “Start” button and then click on “Control Panel” to open the Control Panel Window. Now, Search for “Windows Firewall” in Control Panel and click on it. In the Windows Firewall Window, click on “Turn Windows Firewall ON or OFF” option from the left pane. Now, select the radio option “Turn off Windows Firewall (not recommended)” and then click on “Save” to apply the settings. Restart your computer once done and you’ll not see the problem again on your computer. Windows 10 Service Registration is Missing, or Corrupt error becomes normal after tons of people started facing this issue on their computers. But fortunately, Microsoft fixed this problem with a simple Bugfix released through the update. Only those who are having the older versions of Windows 10 OS are facing this issue while updating the system. If you encounter this problem, make sure to follow any of the methods that we’ve mentioned above, and you’ll get rid of the same within a few minutes.